FOREX: The dollar index is lower on Wednesday, albeit not by much (-0.12%), giving back the slight gains it posted yesterday. The yen plunged across the board as investors rotated out of safe assets, after the US-China trade confrontation was perceived to be milder than feared. Meanwhile, risk-sensitive currencies like the aussie and kiwi recovered some lost ground. STOCKS: US markets climbed on Tuesday, shrugging off trade worries as the tariff actions by both China and the US were somewhat less hostile than anticipated. The tech-heavy Nasdaq Composite (+0.76%) led the pack higher, while the Dow Jones (+0.71%) and the S&P 500 (+0.54%) tracked not far behind, with the latter eyeing its all-time highs again. Looking at futures, the S&P, Dow, and Nasdaq 100 appear set to open higher today as well, albeit only modestly so. Asia was a sea of green on Wednesday too. In Japan, the Nikkei 225 (+1.08%) and the Topix (+1.46%) advanced amid a weaker yen and optimism that neither the US nor China want to escalate things much further. In Hong Kong, the Hang Seng gained 1.13%. Similarly, in Europe, all major indices were set to open higher today, futures suggest. COMMODITIES: Oil rallied on Tuesday, propelled higher by reports that Saudi Arabia would be comfortable allowing prices to rise above $80 per barrel, referring to Brent crude. These reports cast doubts on whether the Kingdom will indeed raise its production to offset supply outages from Iran. The precious liquid looks set to extend its gains today, as WTI is already up by 0.18% at $70.02 per barrel, while Brent is higher by 0.14% at $79.21/barrel. In precious metals, gold is up by 0.45% at $1,203 per ounce, remaining stuck in a very narrow range. Risk appetite staged a remarkable recovery on Tuesday, as traders brushed off concerns regarding the negative side-effects of a further escalation in the Sino-American trade skirmish. US stock markets bounced back, with the S&P 500 coming within breathing distance of its all-time highs, and risk-sensitive currencies such as the aussie recovering ground. Meanwhile, haven currencies like the yen plunged across the board and yields on US Treasuries surged, as investors rotated out of safer assets. 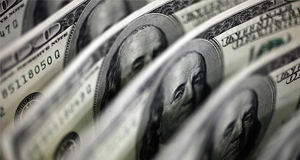 Specifically, the yen fell to a fresh two-month low against the dollar, euro, and pound. At the same time, yields on 10-year US government bonds touched their highest level since May (3.05%), though the greenback failed to capitalize on this, ending the day nearly flat against a basket of six major currencies. As for what triggered this sudden shift back to risk-taking, it seems to have been a case of “things could have been worse”. For starters, the US tariffs were smaller than expected at 10% for a temporary period. More importantly, China appeared reluctant to escalate the situation much further. Yes, the nation did announce retaliatory tariffs yesterday, but only on $60bn US goods (vs the $200bn in US tariffs), and at a lower rate of 5% for some products and 10% for others. If no other levies are announced from China, this could even be perceived as an attempt at deescalating tensions, given that these countermeasures fall well short of being “one-for-one” or equal in intensity. In addition, China did not flat out reject holding talks with the US, as it previously warned it would, keeping the prospect of another round of negotiations on the table. Overnight, the Bank of Japan kept its policy unchanged, delivering no surprises. Policymakers reaffirmed that their ultra-loose policy framework will remain in place for a prolonged period. Given the absence of fresh signals, the yen barely reacted. With the BoJ keeping 10-year Japanese bond yields fixed around 0% while other major central banks like the Fed are raising rates, interest rate differentials between Japan and the US are widening, rendering the yen less attractive from a relative rates perspective. Hence, monetary policy divergence argues for a weaker yen over time, though the currency could always (and unexpectedly) attract safe-haven flows. Elsewhere, the loonie spiked higher, touching a three-week high versus the dollar, buoyed by a surge in oil prices. UK inflation figures are the highlight of the day in terms of data releases. Elsewhere, trade issues and Brexit remain in the background, with any headlines having the capacity to prove market moving. On trade, developments will be monitored after the latest tariff shots between the world’s two largest economies; China announced retaliatory tariffs on $60 billion of US goods, with the US threatening to slap levies on practically all Chinese imports to the country. UK inflation prints as gauged by the consumer price index (CPI) for August will be made public at 0830 GMT. Month-on-month, CPI is forecast to expand by 0.5% after exhibiting zero growth in July. Still, the year-on-year rate is expected to slightly weaken, standing at 2.4%, from 2.5% in July; the Bank of England’s target for annual inflation is at 2%. A data beat may be seen as exerting some pressure on the BoE to hit the rate-normalization button sooner rather than later, consequently boosting sterling. However, the central bank is also wary of updates on the Brexit front. In this respect, an EU summit commences in Salzburg today, with Brexit being on the agenda on Thursday. Also out of the UK, producer price data, as well as the figures on retail price inflation, both for August, will be hitting the markets at the same time as the readings on CPI. Out of the US, housing stars for August are due at 1230 GMT. The numbers of starts is anticipated to have increased by 5.8% m/m, after rising by 0.9% in July; housing starts fell to a nine-month low in June. 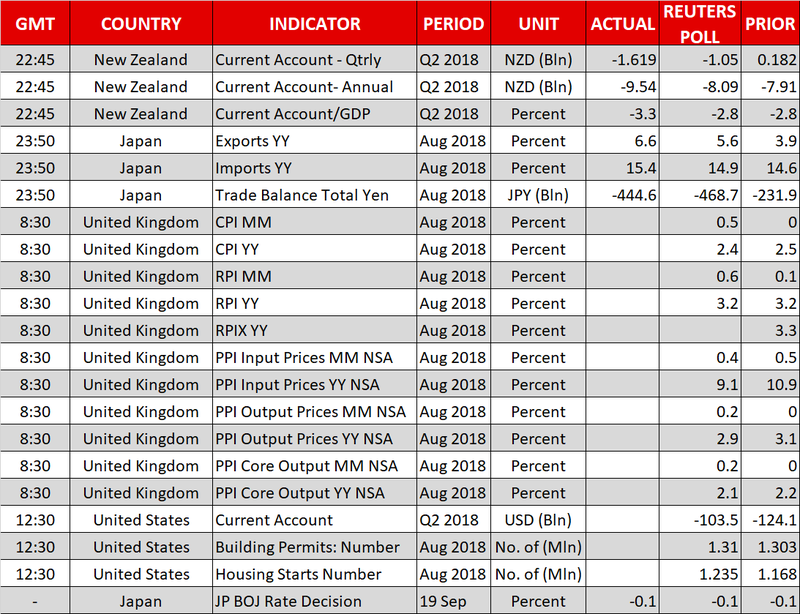 Building permits for the same month are also due at 1230 GMT, as well as Q2 current account figures, which are perhaps attracting more interest in light of Trump’s take on trade – the trade balance is one of the inputs used to arrive at the current account balance. The deficit in the current account is expected to narrow to $103.5 billion, from $124.1bn in Q1. Bank of England policymaker Andy Haldane will be giving a lecture at 0800 GMT, with the ECB chief Mario Draghi stepping to the rostrum at 1300 GMT. Silvana Tenreyro, another BoE policymaker, will also be making a public appearance today. In geopolitics, there seems to be some positive momentum for a breakthrough between North Korea and the US in denuclearizing the former. In energy markets, EIA data on US crude stocks are due at 1430 GMT. A drawdown by roughly 2.7 million barrels is projected for the week ending September 14, following a fall by around 5.3mn during the previously tracked week. GBPUSD posted a notable recovery from early September’s low of 1.2784. It is currently trading around 350 pips above that level, having hit a near two-month high of 1.3175 earlier on Wednesday. The RSI has been heading higher over the last couple of weeks, pointing to a bullish bias in the near-term. The indicator, though, is only moderately positively sloped at the moment, the implication being that bullish momentum may be easing. Stronger-than-anticipated inflation readings out of the UK are likely to boost the pair. Immediate resistance to gains seems to be taking place around the current level of 100-day moving average line at 1.3161. Not far above lies the upper Bollinger band at 1.3193, with the area around it encapsulating the 1.32 round figure as well as being one of congestion between mid-June to mid-July. A previous peak at 1.3362 would increasingly come into scope in case of steeper gains. 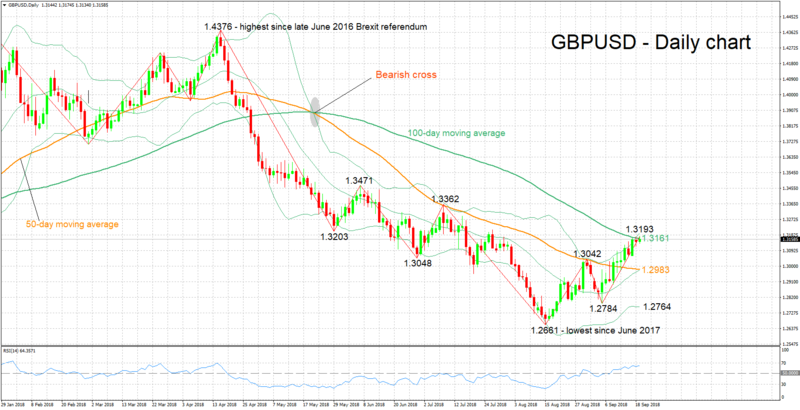 On the downside and in the event of disappointing UK figures, support may come around a previous top at 1.3042, with the focus next turning to the 50-day MA at 1.2983 – this is where the middle Bollinger line roughly lies – a 20-day MA line –, with the 1.30 handle also being part of the zone around this point. Brexit headlines can also move the pair.